Happy 2013! Yay! Couldn’t believe Christmas and the 1st day of the year have come and gone so quickly – not to mention the end of the world thingy that thankfully never happened! We’re still reeling from a severe case of holiday hangover so this post is waaaay overdue. Celebrating Christmas and New Year’s Eve has been a tradition that me and Van grew up with in our families. Now that we’re both a wee bit “mature” and are living with our horde of 6 adorable cats, we have continued that tradition every year. 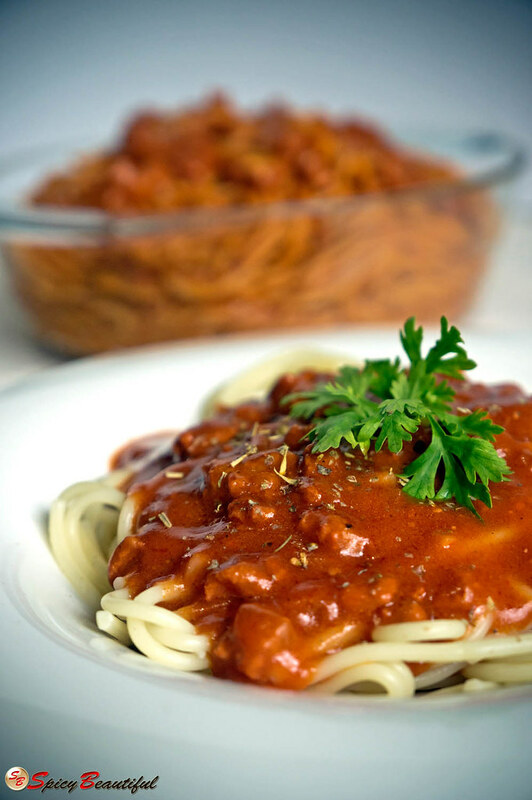 For the holidays, our Hot and Spicy Party Spaghetti took center stage. We accompanied it with a slow-cooked crispy roasted chicken, crispy pata (deep-fried pork hocks and knuckles), our trusted bistek and seafood sinigang, just to mix it up. The secret to my spaghetti is not hot sauce but from a local brand’s hot variant of ketchup. 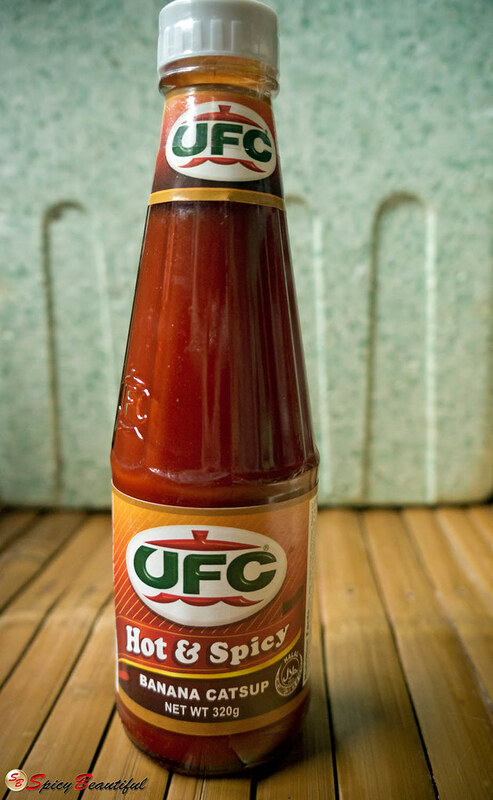 The UFC Hot & Spicy Banana Catsup really lives up to its name. As far I know it is the only hot and spicy ketchup in the Philippines. It gives the sauce the fiery essence that I love without ruining the taste. This is where you can adjust and tweak the hotness of the spaghetti sauce. I usually add 1 ½ bottles when cooking 1 kilo of spaghetti but don’t mind me since I live and breathe spiciness. LOL! Reduce the amount of ketchup to just half a bottle if it’s only a hint of “hot” that you’re looking for. So, here’s to a spicy year ahead of us! Hope you all had a very merry time celebrating the holidays. Happy New Year! 1. Cook spaghetti noodles according to package directions. 2. Mix the milk and sugar with 1 cup of water and set aside. 3. Heat oil in a large pan. Sauté garlic until golden brown. Add the onion and cook until they become translucent. 4. Add the ground meat and stir fry for 3 minutes then pour in soy sauce. Cook for another 3 minutes or so. 5. Stir in the spaghetti sauce and bring to a boil then add the milk and sugar mixture. Simmer for 2-3 minutes. 6. Add in the grated cheese, tomato paste, black pepper and cayenne pepper. Mix well and simmer for 10-15 minutes. 7. Stir in the hot and spicy banana ketchup and adjust the taste with salt. Simmer for another 2-3 minutes then remove from heat. 8. Pour sauce on top of cooked pasta and top with a dash of Italian seasoning. 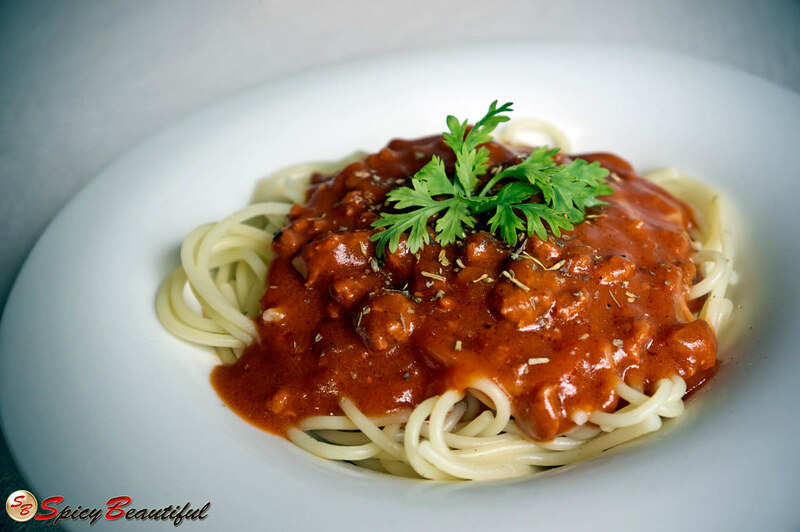 For a party style serving, mix the cooked pasta and sauce in the pan where the sauce was cooked and transfer to a large serving dish. Enjoy!